Last year when I worked at a public library, I suggested we do more displays on current topics in society — racism, refugees, gender issues, etc. This was met with resistance as the city I worked in didn’t want the library to appear to be taking stands on issues (more on that later) but I was permitted to do a display on drug addiction. New Hampshire is one of the states dealing with rampant opioid addiction, and has one of the highest rates of prescription painkiller use in the nation. It was very popular, by which I mean people took books from the display and we had to restock it. That to me was a strong indicator that people want to learn more about what’s happening in the world. Friday (when the news of the Dallas shootings was fresh) at the academic library where I now work, I discussed with a co-worker how shell shocked I felt from the week’s news — it was awful to wake up to news of one violent act after another. I told her it seemed like a good time to make a display about nonviolence and racism, something for people who also felt overwhelmed by the news. She agreed that would be a good service to the community and that she’d like to work on it. I went back to my office. A short time later one of our coworkers called me from the front desk to say the two of them had imagined a problem: wouldn’t people come in and ask why now that it was police who were victims were we putting up a display, and where were we when innocent black men were killed earlier in the week and when mostly hispanic and gay victims died in Orlando? I said that wasn’t the intent at all, it was the groundswell of violence that had caused me to feel we needed to offer a display. Heck the bad news wasn’t even limited to America. There were innocent victims of violence and racial, religious,or cultural intolerance in Dhaka, Baghdad, Syria, Istanbul, Europe, Britain. We agreed tentatively that they would also put out books on homophobia, extremism, Islamophobia, etc. But the conversation unsettled me — was I unconsciously reacting because cops were killed, even though I don’t like or agree with media coverage that seems to favor the lives of cops or members of the military over civilians? (I say that as the wife of a former Marine who hates that implication.) Trying to take a detached look at it I decided my initial sense was that we needed to offer resources on nonviolence and a historical perspective on how America has reached this point. I was inspired by something the Bishop of New Hampshire shared on Facebook: an article I read just before work, on how to be a peacemaker. I wanted to make a display that would help people understand each other and the world. No, I didn’t value police lives over other lives. Why now? Because news of gun violence, as well as racism, was incessant this week. Should we try to retroactively respond to all the other violence that has been in the news this summer? I guessed that was an OK compromise, but it made me feel as if my instinct was selfish, and also made me wish I hadn’t suggested the damn display in the first place. Still, my feelings weren’t what mattered, being inclusive seemed like a good thing, so I just hung up and got on with my work. But later the first colleague came back to me and said we needed to stick to the initial scope of the display: nonviolence and racial injustice in America. She felt it would just look like we were covering all the bases to include other issues, and that she’d rather have a substantive conversation with anyone who asked “Why this display, now?” She got why someone might ask us about it, but was comfortable articulating that whether we should have a display every time something bad happens or on every issue isn’t the point, the point is that yesterday, we just wanted to help people who feel pained by the events of the past week. Like we did. She thought we should honor that, rather than cheapen it by trying to be all inclusive. Her sensible offer to have conversations about the display is just what should happen when people have questions about tough issues or positions. That’s the only way forward — to calmly discuss things. I’m grateful for her perspective and a little ashamed that my own reaction (“fine, include everything and everyone”) was to cheapen the horror, even if I was diluting it with other, equally horrific things. I came by that in part because of my experience in the public sector, where taking a stand was considered taking a side, which was discouraged or even forbidden. Should libraries, public or academic, create displays that present information about controversial or divisive issues? I think they should. People are hungry for something more than news bites, and books can provide more in-depth analysis. Libraries also, as part of our mission, collect resources that present varying viewpoints as long as they meet the standards set for our collections (well written, well researched, well reviewed, for example), and therefore we’re in a position to challenge people to read points of view that differ from their own. If we’re taking a side it’s the side of creating an informed citizenry. Will anyone question our motives? Possibly. But I have a good answer — I’m trying to learn how best to respond to this, and thought others might want to learn too. The Institute of Museum & Library Services published its latest report on public libraries in the U.S recently. I went straight to the state stats. Looks like New Hampshire is in pretty good shape. More evidence that the demise of libraries is not imminent. Meanwhile, we’re ready to start new projects for the new fiscal year at my library. One thing I got started on today is radically reconsidering the reference section — I’d like to circulate some books, move others to storage, and weed the ones that sit gathering dust, their spines indicating they’ve rarely been cracked open. It’s painful, because many of them are wonderful resources. But I’d like to make space for materials our patrons do want to use and check out. A colleague of mine pointed out that this brings up a philosophical dilemma: should expand our offerings of popular materials like movies, even if it means decreasing our purchase of something else, like reference books? Some folks I’ve known in the library world lament that for some patrons, we’re just another video outlet. It can feel like what we are as libraries is in danger if we know some people only come in for movies. Or if we jettison reference materials. If we want to continue to encourage literacy and a love of knowledge and learning, maybe the answer isn’t to buy interesting but rarely used multi-volume reference sets but to choose appealing books and circulate them. And maybe even pair them with movies to encourage cross-circulation? Say someone takes out the Harrison Ford film Witness. Why not offer some Amish fiction (very popular at my library) or a memoir about growing up Amish or a coffee table book about rural America? It’s hard to quickly pull together related materials on the spot, but a display area is a good place to do this. And catalog tools may be going that way. We use Novelist, which recommends related titles when a patron looks at a book our catalog. It would be cool if it pointed people to books when they looked at movies or music as well. Whether our reference section shrinks or our dvd section grows, I’m happy to live in a region and a state where libraries are valued and well-used. When I mentioned the Library As Incubator Project on an email list recently, a colleague replied with a link to Art-o-Mat, which re-purposes old cigarette vending machines into art dispensers. The machines are found in a variety of locations, including libraries. Libraries often schedule performances, films, and readings as well. 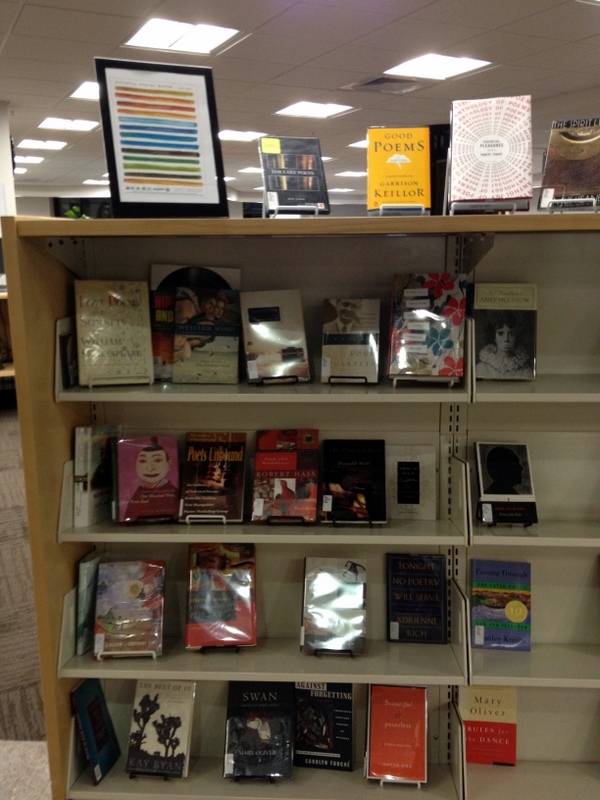 This week Regina Library here at Rivier College is hosting “An Evening of Favorite Poems.” My nocturnal colleague Peter and I had fun creating a display of poetry books. I actually found too many books for our allotted display space and had to put the overflow on a table by the entrance. 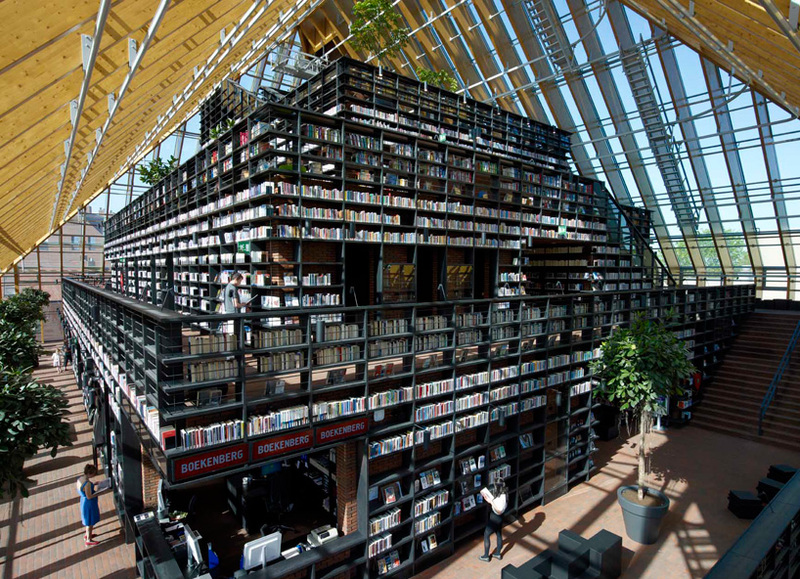 So if you think libraries are just housing books, take another look. Chances are you’ll find the arts.